By Timothy T. Schwartz Ph. D.
TRAVESTY is an anthropologist's personal story of working with foreign aid agencies and discovering that fraud, greed, corruption, apathy, and political agendas permeate the industry. It is a story of failed agricultural, health and credit projects; violent struggles for control over foreign aid; corrupt orphanage owners, pastors, and missionaries; the nepotistic manipulation of research funds; economically counterproductive food aid distribution programs that undermine the Haitian agricultural economy; disastrous social engineering by foreign governments, international financial and development organizations--such as the World Bank and USAID-- and the multinational corporate charities that have sprung up in their service, CARE International, Catholic Relief Services, World Vision, and the dozens of other massive charities that have programs spread across the globe, moving in response not only to disasters and need, but political agendas and economic opportunity. TRAVESTY also chronicles the lives of Haitians and describes how political disillusionment sometimes ignites explosive mob rage among peasants frustrated with the foreign aid organizations, governments and international agencies that fund them. 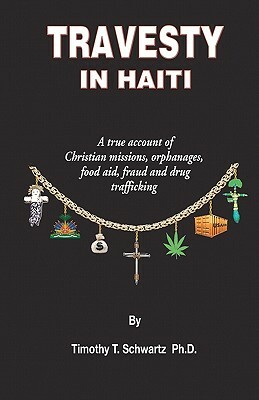 TRAVESTY recounts how some Haitians use whatever means possible try to better their living standards, most recently drug trafficking, and in doing so explains why at the service of international narcotraffickers and Haitian money laundering elites, Haiti has become a failed State. TRAVESTY reads like a novel. It takes the reader from the bowels of foreign aid in the field; to the posh and orderly urban headquarters of charities such as CARE International; to the cold, distant heights of Capitol Hill policy planners. The journey is marked by true accounts involving violence, corruption, appalling greed, sexual exploitation, disastrous social engineering, and the inside world of drug traffickers. But TRAVESTY it is not a novel. It is founded on 15 years of academic and field experience, research, and hard data. It entertains the reader with vivid first hand accounts while treating seriously the problems inherent not only in international aid, but the sabotaging effects of the drug war on economic development in remote and impoverished areas of the hemisphere. Timothy T Schwartz earned a Ph.D. in Anthropology from the University of Florida and then went to live and work in Haiti for six years. His research included 15 months living with impoverished Haitians in the thatch-roofed huts of a remote fishing hamlet and three years residing in agricultural settlements and villages. He worked as a consultant for international aid agencies, including the German foreign ministry (GTZ), the United States Agency for International Development (USAID), French ID (Initiative Developpment), and CARE International, the world's largest international charity. Since leaving Haiti he has been living in the neighboring Dominican Republic where he works as an international consultant specializing in Haitian-Dominican relations and coordinates social impact assessments for private companies. His studies have been funded by the National Science Foundation, the Curtis Wilgus Foundation and the University of Florida College of Liberal Arts and Sciences. Recent publications include the Haiti entry for an encyclopedia of world cultures, Countries and Their Cultures (Macmillan Reference USA: Yale University), an article in the refereed Journal for Research in Economic Anthropology entitled Pronatalism and the Economic Utility of Children in Jean Rabel, Haiti, and an article published in the Caribbean's oldest and most prestigious journal, New West Indian Guide, entitled Subsistence Songs: Haitian 'teat' performances, gendered capital and livelihood strategies in Jean Makout, Haiti."